Do you work for Xcode? Learning about Xcode? We can help. "xCode is intuitive and easy to use"
My favorite feature of Xcode is the quick transition between graphic elements and code. Xcode provides an intuitive project navigation system allowing you to maneuver between modules quickly and effectively. Also, the code completion functionality of the IDE makes coding easy. There isn't much documentation for the few things that require additional research to fully understand. As a developer, often you need to understand what's capable in an IDE before you begin developing. This information can drastically change your approach. We use XCode to develop our proprietary mobile app that runs on iPhone. We originally designed our app using a cross-platform tool. The issue with using a tool like that is that you have little to no access to the inherent, native functionality. This caused us to consider building our mobile application using native technologies. We are currently using the Xcode IDE with Swift3. Xcode's code completion is backward compatible to all supported Swift version. "Is the best and only way to achieve success on iOS DEV!" Is the best and only way to achieve success on iOS DEV! - since it's a tool that it fully compatible with all iOS platforms, this way u can be 100% sure that every bug or error that it can become real, it will have a solution unlike other platforms that manage other languages that aren't 100% native as Xcode for iOS. At the end, having a 100% native app, kind of guarantees that the UX is 100% perfect depending on the iOS device you are planning to use it. It can become a little hard to learn at the beginning how the platform works, but u can find a lot of tutorials everywhere and lots of professionals that are willing to help u in many ways. Udemy and other learning platforms are very helpful. Try to find people or experts that could help u using this great tool. Mainly Xcode is only for iOs development, so basically im solving how to develop solutions in many iOS devices. Generating native 100% apps is the most benefit and satisfactory thing you can get from Xcode. Developing in this tool kind of gives u an advantage amongst other companies that compete in this kind of development market since most of the apps now days are needed to be 100% native unlikely other solutions like phone gap or ionic that do not comply with this kind of requests. "XCode Ultimate Platform For IOS Development"
Xcode is the best Platform where you can build ios Apps and many more. the best thing about Xcode is very simple to use I was very new to use Xcode. You can Also Manage the UI. Best Part of the Xcode is Xcode simulator is faster than Android Studio. I dislike about Xcode is there are so many login options within it like developer login I mean as a fresher to use it. It Is harder to find the login for developer profile which I faced while using it. I recommend Other User to Use Xcode Just because Officially Development is Best For future. Xcode is the best for Ios Development. Xcode is My Trusted Brand. With Xcode I solved My Company App Development Problem I found this platform where I build my company application. The benefits of Using Xcode You Can complete your business need like the main requirement of today is Mobile App. Xcode is the one of the best and officially iPhone App development Platform. Es el único IDE con el cual se pueden crear de forma fácil aplicaciones para IOS y Mac OS. Soporta el nuevo lenguaje de Apple swift. Puedes crear aplicaciones de forma visual, apenas hace falta escribir código. Además se 8ntegra con plugins y con Git. Tiene emuladores para probar la aplicación en distintos dispositivos sin la necesidad de tener que comprarlos. Solo se puede usar en un ordenador mac, es decir, que no se puede instalar en windows, ni en linux... para poder desarrollar hace falta que tengamos un ordenador de Apple. Nos permite realizar aplicaciones para clientes de Apple. Es un mercado al que no es fácil llegar, gracias a la simplicidad de xcode, podemos hacer aplicaciones profesionales de una manera sencilla, eficaz y segura. "The must have software for iOS Dev"
Simplicity, the way it's preventing errors and mistakes. Coding in Swift is very satisfying thanks to Xcode. You can use the Storyboards to build the front end interface. In this case everything is almost interface only, with drag and drop objects, and visual settings. I like this because it can really give the opportunity to beginners to develop apps so much easily than 100% programmatically. As an ex graphic designer this is very convenient and I am used to such an environment including UI design patterns. Not the program itself but sometimes there are too many Objective C in Swift. Sometimes the errors are appearing way too fast. I don't even have the time to finish the lines of code I was writing that Xcode is already complaining and showing red errors. It can be a bit disturbing at first, but we are used to it. This is definitely the must have platform to use in iOS Development. Read carefully the Apple Documentation provided on their website which is incredibly good and detailed about how to use properly the software. For demanding apps building, I recommend using a powerful Mac machine in this case you will be able to drastically minimise the building and testing process. iOS Development, main tool. The fact that every single iOS Developer is using the same software can really improve the reliability and ressources in term of support and help. "As a developer with a background mostly in Android, I must say Apple got it right "
There are so many things to like about xCode. But what I like best is the developer experience of creating UI. The fact that you must pay to be a developer. There is only one option to develop a mobile application for iOS. Apple does not allow the use of any other tools. The inflexibility might be annoying for some but as a long time user and developer of all kinds of applications, I must say XCode is one of the best IDEs I have worked with. The experience for developing UI is fantastic. Its easy to get started even with very little experience (which is more than I can say for Android). There is the overhead of learning Objective C or Swift which aren't terribly popular languages but with a background in Java I can tell you Swift will make your life much easier! We are developing high end mobile applications for iOS. "Fully integrated to develop ios apps"
The debugging tool is the best I have used, the use of breakpoints, memory and power management is very good and helps the developer a lot. I love that there is an emulator with all iPhone and iPad devices to test all screen sizes. Also, one of my favorite features (included not long ago) is the ability to launch the app on your iPhone without having to connect it to your Mac. There are also problems when connecting storyboards to the controller, for example, when there is a change in the class of a viewcontroller, sometimes it is necessary to restart the IDE. I have developed multiple applications for iPhone, from several clients. The result was as expected, the tools provided by xcode are perfect for application development and testing. The main problems to solve were to develop applications that followed a client-server structure, for which it was necessary to implement calls to a rest API. With the debugging tools it was very easy to follow the traces of error and end up developing a good product. You may have experienced some words on Google even though you did not remember the exact name or spelling, but you still find the answer. You may have encountered some words that you do not remember. "XCode and Swift as a language combined make an extremely smooth User Experience"
The way that front-end development is handled. I believe that swift and Xcode alongside it does an amazing job of decreasing the effort and semantics involved in front end development while maintaining the specificity that CSS provides. Also immediate transfer to an iPhone is extremely convenient for testing of course, especially since it is integrated. The simulator and environment in general is also faster than Android Studio. I could not say I dislike anything in particular about Xcode beyond the fact that is advertised as a one size fits all programming environment which I would say it is not. I would say that on the contrary to my previous assessment that sometimes the simplicity of the UI rendering lends itself to less effective design, but this is outweighed by the option Apple retains of writing the design from scratch rather than through drag and drop features. Make sure to read up on the hotkeys and other functionality. It is highly deep as an IDE and enables a lot of additional functionality if you know where to look. It provides an easy to use app development platform. With a great UI that makes front-end development far simpler for developers. This is definitely advantageous compared to CSS and HTML because of the ability to be less semantic and more efficient with UI and UX creation. By also making UI visualization a key part of the Xcode system it promotes quality development that is fully aware of the look and feel of the application. I was glad to see the improvements they made on this latest version of Xcode. The LLDB still needs a little work, but it's getting there. Overall, this is a really solid product, and we use it frequently here at our business. As an IDE,Xcode does really well. It does a great job uniting the iOS and OS X toolchain in a single environment, but it does have it's fair share of kinks to work out. 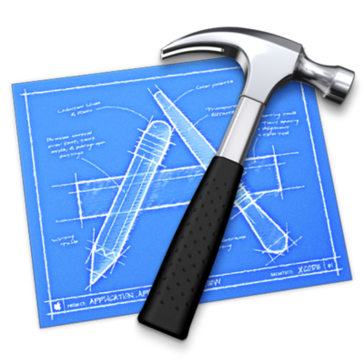 Xcode gives full control of the app, with all the frameworks and libraries ready to be used. There’s a high level of device independence when compared to developing hybrid apps. I wish the IB assistant was a little more solid than it is, and the code completion is erratic from time to time. This is a great review of an incredible programming tool. My only complaint so far is that I can no longer use CMD + B to build my project. Appart from that Xcode has been improving in stability and product quality enormously since it's initial version. Personally I find the editor window on the build results and such quite a nice addition, as those who don't want it can easily hide it. To me, it is nice to be able to check the error locations within the same window. A recommended upgrade to those using earlier versions. The manner in which that front-end advancement is taken care of. I trust that quick and Xcode nearby it works superbly of diminishing the exertion and semantics associated with front end advancement while keeping up the particularity that CSS gives. Additionally quick exchange to an iPhone is incredibly advantageous for testing obviously, particularly since it is incorporated. The test system and condition when all is said in done is likewise quicker than Android Studio. I couldn't state I detest anything specifically about Xcode past the way that is promoted as a one size fits all programming condition which I would state it isn't. I would express that on the in spite of my past appraisal that occasionally the effortlessness of the UI rendering fits less viable structure, yet this is exceeded by the choice Apple holds of composing the plan sans preparation as opposed to through simplified highlights. It gives a simple to utilize application improvement stage. With an extraordinary UI that makes front-end advancement far less difficult for engineers. This is certainly invaluable contrasted with CSS and HTML due to the capacity to be not so much semantic but rather more effective with UI and UX creation. By additionally making UI representation a key piece of the Xcode framework it advances quality improvement that is completely mindful of the look and feel of the application. I love that Apple has built Xcode to build apps for iOS, macOS, tvOS, and watchOS. The functionality of Xcode is quite robust, and it generally does a lot for helping design an app. It has some really wonderful built-in layout features (called auto-layout) for arranging different views on a page in each app. It's very visual and helpful while designing on the storyboard in Xcode. Sometimes it feels as if Apple only releases Xcode updates every so often when there are more bugs than I think they probably want. The bugs are usually fixed in incremental updates, but the main updates come every year or so, most commonly to support the latest version of Swift that comes out each year. There are only a few other IDEs available for Swift, and Xcode is the best of them all, in my opinion. Apple admins Swift, and they build Xcode to go with that language. It has the most built-in support for the software that developers write with it. Here we use Xcode to build native apps in Swift. It really is a great tool. I have realized that there are also wonderful source control features built in to manage a git repo and remote, committing and editing commit messages, and managing source control blame. My most loved element of Xcode is the snappy progress between realistic components and code. Xcode gives a natural task route framework enabling you to move between modules rapidly and successfully. Additionally, the code finishing usefulness of the IDE makes coding simple. There isn't much documentation for the couple of things that require extra research to completely get it. As an engineer, regularly you have to comprehend what's proficient in an IDE before you start creating. This data can radically change your methodology. We use XCode to build up our restrictive versatile application that keeps running on iPhone. We initially planned our application utilizing a cross-stage device. The issue with utilizing an instrument like that will be that you have almost no entrance to the inborn, local usefulness. This made us think about structure our portable application utilizing local innovations. We are as of now utilizing the Xcode IDE with Swift3. Xcode's code fruition is in reverse good to all bolstered Swift rendition. Xcode provides a straightforward view of making apps for Apple brands. The interface is intuitive and simple for beginners and contains many well-placed menus that make software development a breeze. Having used other software building suites, I have found that Xcode is fine tuned to the macOS operating system. There are hardly any long waits or any updates that are left in limbo. I can't overemphasize the cleanliness of the user interface. The fonts and color schemes are carefully thought out so if you spend 8 hours like me writing code, you're not staring at some poorly designed font. There's not much to dislike about Xcode except maybe Apple Watch development. I have found that installing Apple Watch apps takes remarkably more time than iPhone apps because there are no ports on the Apple Watch. It makes you wonder how anyone is patient with the platform. Xcode is a stable software program that has created all our apps. 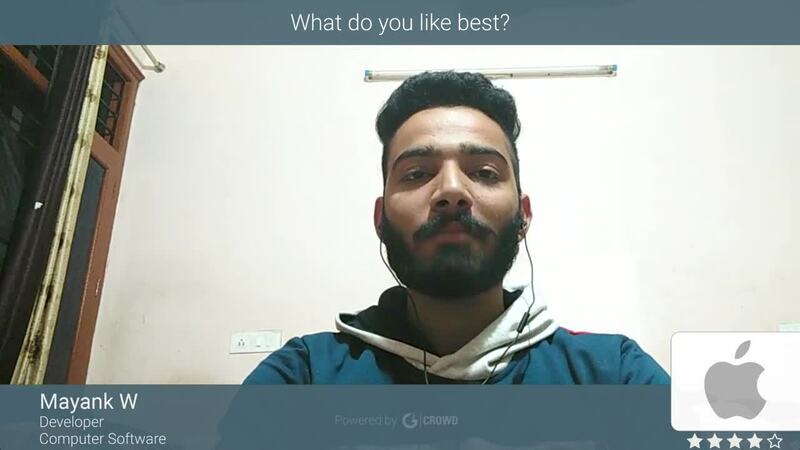 The technologies embedded in it such as Core Data, Swift, UIKit, AVFoundation and many more are really intuitive and do not require lots of study for basic use. The benefits I have realized from Xcode is that my code is easily migrated to the newer iterations of Swift, and that the apps created have been easily modified and debugged. "Great IDE for iOS development"
Since it's an instrument that it completely perfect with all iOS stages, along these lines u can be 100% certain that each bug or mistake that it can turn out to be genuine, it will have an answer not at all like different stages that oversee different dialects that aren't 100% local as Xcode for iOS. Toward the end, having a 100% local application, sort of ensures that the UX is 100% immaculate relying upon the iOS gadget you are wanting to utilize it. The investigating device is the best I have utilized, the utilization of breakpoints, memory and power the board is extremely great and helps the designer a ton. I cherish that there is an emulator with all iPhone and iPad gadgets to test all screen sizes. Little program crashes, issues in the wake of bringing in cocoapods conditions, vital restart of the IDE to oversee imports. Try to peruse up on the hotkeys and other usefulness. It is exceptionally profound as an IDE and empowers a great deal of extra usefulness on the off chance that you realize where to look. Watch instructional exercises on Youtube and a prescribed move up to those utilizing prior adaptations. I have built up various applications for iPhone, from a few customers. The outcome was of course, the instruments given by xcode are impeccable to application advancement and testing. The principle issues to unravel were to create applications that pursued a customer server structure, for which it was important to actualize calls to a rest API. With the investigating devices it was anything but difficult to pursue the hints of mistake and end up building up a decent item. "Essential tool for Mac/iOS development"
It’s a first class IDE. It might have shortcomings, but you can’t beat Xcode because it comes straight from Apple and it’s as close as it can get when it comes to supporting their SDKs. I haven’t tried other IDEs for Mac in production, as I prefer to rely on first-party solutions and take advantage of preview versions of SDK. Other apps would have to play catch up to support them. Stellar part of Xcode is Playgrounds. It's a fun and easy way to test ideas and code snippets. I even use it for simple scripting and automating tasks. Overall I’m happy with Xcode as my main working tool, but occasional crashes or obscure minor bugs get me upset sometimes. Such minor bugs are slow to get fixed. It’s understandable, given the scale of the product and more important priorities. On the plus side I can’t think of any major issues with Xcode. It might be overwhelming as a first time IDE, but it’s well designed and well organized. I’m developing Mac apps. Given longterm experience with Xcode and productive familiarity, there’s little reason to even research possible alternatives. I love that you are able to instantly see your results in the right pane and using the iPhone simulator has a lot of appeals and is easy to use. Also, I love that you can put your app on your physical device for testing purposes and such. The ability to be able to see the errors of your code immediately helps with overall development because it tells you where the error is at specifically and also will not let you run your program if there is a significant error(red), but will also tell you if you have a minor error that should be looked at, but won't stop your program from running. You don't need to sign up for a developer account with Apple until you are absolutely ready to submit your apps, but you can mess around and test your app with no issues and I feel that this is amazing and extremely helpful. At this point, I haven't found much that I don't really like. My overall experience has been very good. Use it! The best thing about Xcode is that it is free. You don't have to pay for anything and you get to start programming immediately. I am a new swift developer who is using Xcode to practice before I start to make an app for the members of my business. My app is going to help with the ease of customer use when logging into the app with he ability to download and watch videos or get tips and tricks. "Xcode is a great tool for iOS development"
I like that Xcode has convenient user interface that allows to have everything I need to develop an app with just one click. I can quickly switch between different tools and hide the ones I don't need at the moment. Xcode IDE is pretty heavy in terms of its size on Mac, it updates quiet slowly and takes a lot of space. I also don't like that sometimes it can stuck and I have to force quit it. It happens to crash from time to time without a reason but it looks that it is being improved from version to version. Xcode IDE has everything you need to start developing iOS apps. I recommend using the latest version of Xcode and always stay up to date. I use Xcode to develop iPhone apps. It was quite easy to start with (comparing to other IDEs) and that is one of the main benefits for me. I love that I can easily arrange files in the project just using drag and drop. And I can say the same about connecting UI controls to code. I like that it has a very good simulator integrated with it. And it also allows to preview app's design on different devices which is very convenient. "Creating apps for iOS using Xcode"
Xcode has improved vastly over time. The best part of it is the way in which you can easily create the UI parts of the app and link them to the code. It is best if you can create a single UI that meets all devices, as that keeps your UI design simpler. Taking an app from being just local to being for sale on the app store is now much easier than it used to be, with all of the difficult steps now done automatically for you by Xcode. The ability to create libraries in swift and reuse them is very good, but also somewhat difficult to link in at times, so this can count as both a plus and a minus. If you have to create a different UI for different screen sizes then that can be tricky. Also sometimes Xcode gets confused and you need to reboot to reestablish the connection with your device. Some errors that you get when developing (especially linker errors) can be very hard to debug. The problems you can have linking in user created libraries in swift (also see things I like best) is harder to use than it should be and creates excessive problems. Really the only choice you have if you are developing for iOS and don't want to be reliant on third party solutions. Creating apps for sale on the Apple app store for both b2b and b2c systems. "Xcode is good for web design"
I like how Xcode simplifies everything involved with editing into one software that you can use to create different apps. I also like how Xcode uses the Swift programing language. This makes it easier to use. At first, I thought that it was going to be hard to use because I was not use to it, but it makes app developing a lot easier. It offers a lot of features. I do not like the interface builder at all. The interface builder is suppose to help you design apps without using code, but it seems like you can only use this for basic things. More advanced editing requires you to have a knowledge of coding. The debugger also doesn't catch all of the mistakes and some things that it flags as mistakes are not mistakes at all. Give Xcode a try, but it takes a lot to get use to. Tutorials help a lot. I would advise trying to seek out independent tutorials to help gain the basics of Xcode. "A required tool for everyone developing for Apple platforms - for better or for worse"
Xcode is actually a huge monster of an IDE - there are so many features that you'll likely never use them all. A lot of them are very useful though - for example, Instruments are great tools to debug your apps, find memory leaks, debug performance issues, etc, and not having to install additional tools is very helpful. Everything you need to develop iOS and Mac apps is built in, from building interfaces to debugging. Being a huge IDE has its problems, as crashes and mysterious problems are common. Experienced Xcode users know some of the "tricks" by heart - deleting some internal folders when builds fail, restarting the app, avoiding SVN changes while the project is still open, etc - but new users will probably be a little frustrated by the constant problems they might face initially. There are also issues related to using Swift with Xcode, as syntax completion often fails mysteriously and build times are noticeably slower than projects using Objective-C. I really recommend using other communities such as Reddit or Twitter to keep yourself informed, since sometimes release notes can be difficult to parse and there are lots of quirks to every new version of Xcode. Either way it's always a good thing to get connected to the community. To answer plainly and simply: It's practically the only way to develop, build and upload iOS and Mac apps, which is a business requirement for us and many other companies out there. Xcode is really great for designing cool User Interface and creating a good-looking UI quite easily. It is better than most of the other IDEs out there it's quick and easy. One might find it a little bit difficult to get into the rhythm of how Xcode works, but once you get the hang of it, you are good to go. Basically, IDEs are meant for code completion, refactoring etc. In these areas, Xcode is generations behind than other IDEs such as NetBeans or Visual Studio (I'm talking about just writing the code). So, I would say I'm not a big fan of writing my code in Xcode. I'm not sure if I or any other Xcode user will say that it's the best IDE out there, but if you are looking forward to developing iOS apps, or apps for any other Apple product you will have to work on Xcode, and it's not that bad, I mean it's alright. For any client, apps have become an important part of their company nowadays. So, they need to develop Android and iOS apps. And to develop an iOS app you need to use Xcode. Obviously, Xcode helps in creating better optimised, fast and beautiful looking apps to match the Apple standards of perfection. "Wouldn't recommend, but you have literally no choice to use it!" Managed uploads and version control to itunes connect, which is an advantage above android. ( react native ). The simulator is a great tool, very accurately depicts an iphone / ipad etc and speeds up local development a lot. Clumsy layout, difficult to find what you need to do, errors very poorly displayed. Simulator does not handle push notifications which can make local development trickier. Building to a device is also fiddly and often throws errors that you do not get on building to the simulator. Very little documentation for xcode, very often a case of google that error and solve it yourself. Little if no support options? The whole software appears as though it has had loads of extras bolted on over the years which have made the ux and ui very clumsy. Its also an enormous program ( ~20 gbs ) which when you have to use a mac ( another flaw for my poor linux friends ) takes up a huge amount of a 128gb or 256gb macbook harddrive. Simulator slows down after protracted use (appears a some processes build up over time on react native). Your app build is very fragile! Be careful updating pod dependancies etc, e g. High Sierra recently updated my ruby version which broke my pod install and forced 5 hours of installing / reinstalling and hoping for the best before it was fixed. We use x code to develop and release the iOS of our react native app. Has enabled us to get live on the app store, but as you are forced to use it thats not all that impressive! "Easy to use and Powerful all around!" The interface is nice and clean looking compared to others. There are certain functionalities that make it easy for beginners such as drag and drop. I've made quite a few apps and to be able to publish to the app store directly from Xcode is amazing. The simulators are buggy and not really functional at all. The controls to the program are a bit stuck meaning your computer could freeze a couple times. You should give it a try, its not easy at first but beginners will get the hang of it. I've built apps that have helped financial businesses. These apps have grown extensively and hope to make more in the near future. "Beginner Friendly iOS Dev Software"
As a matter of first importance interface is perfect when contrasted with different IDEs. Intuitive makes it simple for amateurs to become acclimated to quick functionalities. I have just conveyed 3 applications in application store and can distribute straightforwardly from IDE which is the greatest accommodation as I would like to think. Troubleshooting application is simple, you can print investigate articulations in support and run it or include breakpoints. Presently has a dull topic too which I totally love for the greater part of the applications. Hangs a couple of times when I switch in numerous tasks. Perhaps in light of the fact that a portion of my old activities are as yet dependent on target c and not on quick. Test systems controls are bit inconvenient. There are numerous test systems for iPhone, iPad however when you open products at same time, processor gets extremely hot. What's more, you need to control test systems by console alternate routes. Fundamentally Xcode is just for iOs improvement, so essentially im tackling how to create arrangements in numerous iOS gadgets. Producing local 100% applications is the most advantage and acceptable thing you can get from Xcode. Creating in this apparatus sort of gives u preference among different organizations that contend in this sort of improvement showcase since a large portion of the applications now days are should have been 100% local impossible different arrangements like telephone hole or ionic that don't follow this sort of solicitations. "Good ID for C++ development"
The best about Xcode is that the interface is extremely user-friendly. Using this product makes it easy to build and run source code files in multiple languages. Xcode is popular for macOS, iOS, watchOS and tvOS software development. However, it can do much more than that. For instance in my case I use it to teach my students development in C++, and my students love it ! Most of them have no prior coding experience and are happy to be able to write their code and run it easily on a friendly environment. I really recommend Xcode not only for Mac related development, but also for developing in other languages such as C and C++. When starting to use the product, it is not easy to get hang of all the available options. It takes some time. Maybe it would be good to include some short tips every time the product is opened. It is a good bet if your organization is equipped with Macbook laptops. It can be much easier to use than using the terminal. I use this product to teach my students concepts and software implementation in C++. Xcode is very beneficial for my new students who have no prior coding experience, because it's very user-friendly and easy to use. "A bit of a clunker, but really your only option"
The layout of Xcode is phenomenal. It's interfaces are, for the most part, very intuitive and easy to use. The debugging works well and can be used to solve issues very rapidly. Apple has, in classic Apple style, told you exactly how this IDE is going to be laid out. You want the Navigator to be on the right instead of the left? Too bad. You want the Utilities at the bottom instead of the right? No, your wrong; it belongs on the right. I do miss the flexibility of Visual Studio, where I could but any tab anywhere I wanted. Not every developer has the same sized monitor and the same method of working, so it's a little frustrating that I can't customize my workspace very well. Some areas of the designer are a little slow. The real-time error identification lags far behind the lightning-fast speeds of Visual Studio, and the storyboard designer can frustratingly slow if you need to move back and forth between several storyboards quickly. Take a look at the other options, but you should strongly consider this product that has been developed by Apple. There is a lot of support on the internet to help you through the most common of its bugs. Xcode is the way to develop for IOS. That's all there is to it. We as a company needed an IOS app, so we used the tool that was the simplest to set up and the quickest to get running. "One of the best IDE/coding software which comes along with Macbooks." I have been using the Xcode application ever since I bought my first Macbook. The Xcode is super easy to use and very user-friendly application for working on my day to day software development projects. And being a software developer and also as a student working with tools getting to work on tools on my MacBook which doesn't require to buy any more license software makes life easy using MacBook. And the best thing about Xcode is that it works seamlessly on my MacBook Pro. On my macOS, it matches the theme also. And apart from that the shortcuts to copy and edit the code it seamless on the Xcode. It has helped me reduce my development time all because it's super easy to use which makes my life easy making software. It's very difficult to find a thing to dislike about the Xcode. Definitely, a must use for developers using Macbook. I am using the software to work on my assignment and projects day to day. And I have realized that working on assignments on Xcode has helped me code and work on my projects very quickly and save time a lot. "Xcode - The complete product for iOS Dev"
1. Sometimes it crashes with no such reason. Sometimes it hangs as well. 2. Linker errors are tricky to solve. Better verbose can help. If you really want to develop native application for iOS and Mac, Xcode is the best IDE. There are lot of cross platform tools available in the market. However, none of them are as promising as Xcode. 1. We are developing iOS native applications for iPhone, iPad, Apple Watch and Apple TV. 2. We have also developed few in-house Mac applications as well. "Heavy and full of bugs"
"Necessary evil for iOS Browser Automation"
It's the only way to simulate iOS Safari; not easy to support iOS Chrome. Automation with Appium is not possible without XCode, but there tends to be version compatibility issues all over the place: In order to use XCode 8.3 on El Capitan, only v0.25 of Carthage is supported. However, the download for XCode 8.3 is not easy to find. I ended up having to write 3 versions of the install instructions for our browser automation project since XCode 9 won't run on anything lower than Sierra. This type of thing makes development on iOS a HUGE hassle. AVD's are MUCH easier to manage. "Great integrated development environment for projects"
Love the interface, and it's amazing to see what you can create using this tool. Allows easy reading and writing of code, and publishing couldn't be more of a breeze. The editor itself is very intuitive to use, and performance of the application is fast--compiling and testing code is easy enough provided you have a machine that is relatively well-equipped. Since Xcode can only be used with the Mac OS, one inherent limitation is that you can only use it with a native Mac machine or a partitioned virtual machine running Mac OS. It would also be ideal to have something that allows a publish without a license that costs money. Xcode is part of the Apple ecosystem, and this presents some unique challenges and advantages. One such dichotomy is the Apple developer licensing, which is not expensive, but is a requirement to publish and use apps for anything but personal use. It is the go-to for iOS development, and there are synchronicities with the Apple ecosystem. It is also a very quick and easy way to develop a concept or project and get it out into the world. "Xcode - Strong IDE, still long way to go"
Once you are familiar with Xcode, it is very easy to use and extremely powerful The thing I like most is inclusion of a lot of other tools for debugging really hard issues like Leaks, Analyzer, Allocations and File Activity. The user interface is pretty nifty and slick, and hotkeys are life saver. I absolutely detest the provisioning profile management from Xcode. Its cryptic, not good enough documentation, and its like a black box which when works, is magical. But when it doesnt, its a nightmare to deal with. I wish Xcode makes it more transparent and gives more control to the power users related to codesigning, developer account and provisioning profiles. Another thing I hate is Apple's annual releases of Xcode with breaking changes. This makes it a nightmare to keep our product working fine on latest OS with new Xcode. More often than not, we have to make alot of changes to our product to ensure that its compatible with latest releases of OS and Xcode. I would urge Apple to think hard about backward compatibility to make consumer's lives little easy. Its a learning curve, but once you understand, its a pretty powerful IDE. And there are no other official IDEs for Mac/iOS app development, so better get used to this. We build iOS and Mac apps, and use Xcode for them. Since everyone uses Xcode, we have some harmony of configurations and profiles across developers. If someone finds something useful/interesting, its always benefitting rest of the dev community since all of them use Xcode. We are also able to manage small projects by directly using Xcode project files in source repo instead of generating projects on the fly. This works because of same developer tool is being used. Integration into the Apple ecosystem. Given it is developed by Apple, this shouldn't be a surprise. It is capable and has everything you need to develop software for the Apple ecosystem. We are going to need a bigger text box for this one. It is clunky. For me, I spend more time figuring out how to do something opposed to just doing it. It has potential but seems to fall short. I try to draw a flow from one screen to another and follow the directions and nothing happens. Google it, still nothing. Manually add the code and then it lets me draw the connection. Well that was helpful given its a GUI. I would almost rather visit the dentist then have to use it. If developing only for Apple and/or have a need/desire to use Swift then xCode is your choice. I would however take a strong hard look at Visual Studo and/or Xamarin if you want cross platform and/or C# capabilities. "You Pretty Much Have to Use it"
For creating UI's for iOS apps, it's very good at what it does. Easy to switch between scenes and takes a lot of coding out of connecting scenes to each other. It's pretty terrible compared to its competition when it comes to coding things that aren't Swift/Objective C. Which I mean Swift/Objective C is what XCode is made for, I get it, but my Mac tries to use XCode for everything and Apple just needs to accept that XCode isn't that good for everything else. I highly recommend making peace with the fact that you're not allowed to use anything other than XCode for iOS app development. The sooner you make peace with that fact, the sooner you can reach the acceptance phase of your grief. XCode command line tools don't work on Windows anyway. Creating iOS apps. I realized the benefit of being able to make apps with the only software which is allowed to make iOS apps. "Xcode - Powerful Design Tools"
The Xcode IDE additionally has a smooth environment that makes work processes more consistent. Since it has a worked in Assistant Editor, clients are promptly provided with helpful codes on a side sheet, giving them a chance to complete their app quicker. Xcode IDE is furnished with apparatuses that let it speak with the Apple developer website. Along these lines, clients can empower Apple benefits on their app and distribute their item on the App Store when it is finished. 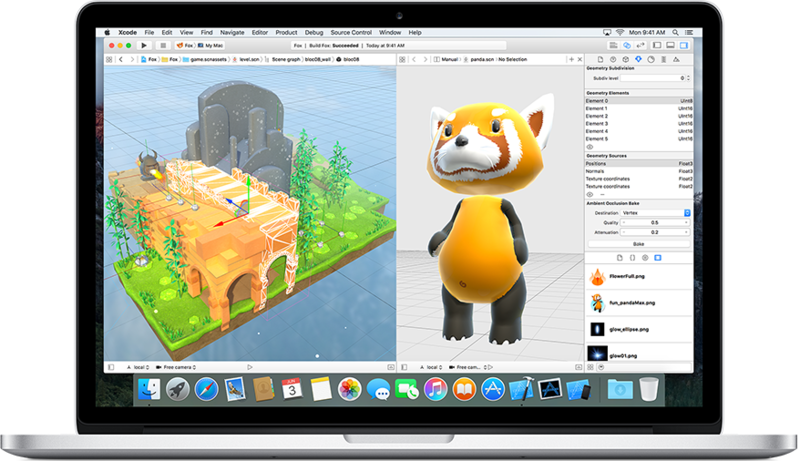 Xcode IDE empowers developers to make apps for Mac, iPhone, iPad, Apple Watch, and Apple TV, it doesn't give them a chance to make only them. That is on account of the application has an incorporated Assistant Editor that shows records it regards accommodating in the coding procedure without intruding on the creation and altering happening on the primary window. With this, developers can immediately discover extra information that can help them in finishing their undertaking at a quicker pace. Xcode requires a more costly Mac rather than a cheap PC. The value contrast is truly steep in the event that you need a superior advancement framework. XCode is essentially constrained to delivering applications for the Apple group of gadgets, or, in other words critical impediment considering the quantity of Windows work areas and Android gadgets, and all the Linux stuff as well! It has been an extraordinary ordeal planning and creating ventures on XCode. It gives full control of the app, with every one of the systems and libraries prepared to be utilized. There's additionally an abnormal state of gadget freedom when contrasted with creating cross breed apps. Every versatile stage that the local app is produced for, stipulates its own one of a kind advancement process. "Swift on Xcode is a breeze!" Very awesome how easy Xcode integrates the swift language to help you create all sorts of apps. Very easy to just import any sort of files from mp3 music files to jpeg image files, you name it. I dislike some of the error messages that appear because they are unclear on why your file is crashing. Make use of its ability to help produce iOS apps or try it out as your everyday code editor. 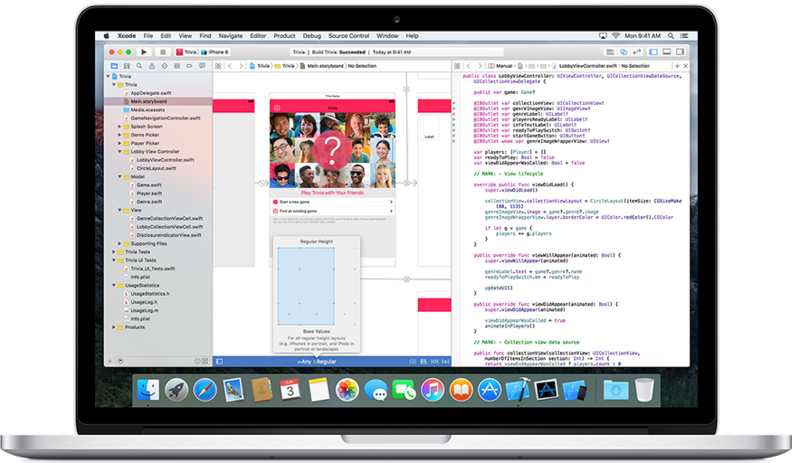 Xcode takes a bug chunk of coding walls programmers hit everyday and solves them for you! Benefits include built in tips and recommendations that help produce better code. "Amazing IDE for Mac Users"
Xcode offers a wide variety of features, such as emulator for iOS devices, code editor and simulator section, terminal, etc. but the best feature in my opinion is that Xcode is extensible, and a lot of amazing extensions can be downloaded to enhance the user experience. I also like the debugger built inside this IDE (which would be my second best feature). It really helps fix issues that might occur through the live testing of the app during emulation. I don't really dislike anything, but just that it takes a lot of memory when in use. However, that is totally explainable since this is a IDE (which are meant to be really heavy), but the amazing features overweigh memory occupied. Definitely try using it for developing Mac/iOS apps/softwares. Provides great productivity for the aforesaid. Trying to develop iOS apps for different purposes. The iOS device emulator really helps in testing, by speeding up the process and providing great debugging tools. "Easily develop for Mac with this great tool"
Xcode offers a development environment for mac, with which you can create applications for different IOS operating systems, you can add emulators of all types and you have a good debugger and you can also configure your entire project the way you want, I like that it is always updated and at the forefront of the latest news. Only with a Mac computer, you can have free access to this tool, but you must pay a developer license if you want to publish your application. Being such a complete environment allows me to develop applications of all kinds for different mac devices, so I do not need another tool to do my work. "Xcode is good for app design"
Xcode is one of the best programs for designing apps. We use it mainly for our app we are developing for customer support. So far the program has made editing and writing code really easy. I like how good the software is at catching mistakes and editing source code. I also like how Xcode is compatible with swift code 3 and 4. Xcode and be slightly difficult to use starting out. You do need to have a really good understanding of code before trying to use the program. Xcode seems like more of a code editor instead of a code writing program. I would like to see Xcode provide more support for code writing while also maintaining the ability for code editing. We are using the program to create our customer support app.